You may have encountered such weird things: You put in your modem with two bandwidths, 2.4GHz and 5GHz. Your computer only sees the one of 2.4GHz. This might be caused by driver issues. Before you move on, it’s suggested that you update the driver first. If you don’t have the time, patience or computer skills to update the driver manually, you can do it automatically with Driver Easy. The other probably reason is that your computer may not have 5GHz bandwidth capability. You could check it by following the steps below. 2. Press Windows key and R (at the same time). A run dialog will appear. 3. Type cmd in. Click Ok.
4. 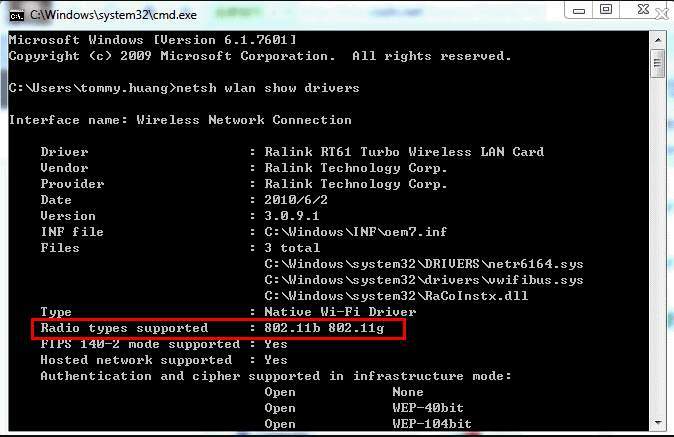 On the Command prompt window, type “netsh wlan show drivers“. Press Enter. 5. Look for the “Radio types supported” section. If it says that the network adapter supports 802.11g and 802.11n network modes, it means that the computer has 2.4 GHz network capability only. If it says that the adapter supports 802.11a and 802.11g and 802.11n network modes, it means that the computer has 2.4 GHz and 5GHz network capability. If it says 802.11n 802.11g and 802.11b network modes, it means the computer has 2.4GHz network capability only.